Ezekiel is lifted up by the Spirit of God being brought to the eastern gate of the Lord's house, where he sees 25 men at the gate's entrance. God tells Ezekiel that "these are the men who plan evil and give wicked advice in Jerusalem, saying, 'It is almost time for us to build houses. This city is like a cooking pot, and we are like the best meat.' So, prophesy against them, prophesy, son of man." What I am getting from the letter to the exiles that Jeremiah sends is that God plans on restoring the people of the Kingdom of Judah back to Jerusalem. He plans, if the people listen and obey Him, to multiply them should they do good. These people should do good things so good things happen back to them. God then tells them to not listen to magicians or false prophets. But these men aren't sent from God. Then the Lord instructs Jeremiah to tell the people that Babylon will rule over them for seventy years or rather four hundred ninety years (seven times seventy is four hundred ninety). At that time, at then end of those seventy sevens God will keep His promise to restore the people back to Jerusalem. They will call on God's name once again. Once they start praying to God again, He will listen. They will search for Him, and they will find Him. God says, "I will let you find me. And I will bring you back from your captivity. I forced you to leave this place, but I will gather you from all the nations, from the places I have sent you as captives. And I will restore you back to Jerusalem" (Jeremiah 29:14, Expanded). He has plans to prosper them. Plans that aren't to harm them, but to give them a hope and a future (v. 11). Then God shows to Jeremiah that the king on David's throne and other people, Jeremiah's relatives who aren't captives that God will send sword (war), famine (hunger), and plague (terrible diseases) upon them. For these people are rotten to the core, like bad figs. God will chase the people with these things making them hated among the kingdoms of the earth (known world at that time). The people from the nations will curse the Judaites; they will be shocked and use those from Judah as a shameful example wherever God makes them go. For these people from the land of Judah didn't listen to God's message. He sent servants and prophets to them, but the people never listened. The captives God forces to leave Jerusalem to Babylon need to listen to the message from the Lord. He is Almighty, the God of Israel, who says this about Ahabe son of Kolaiah and Zedekiah son of Maaseiah: "These two men have been prophesying lies to you, saying that their message is from me. But soon I will hand over those two prophets to Nebuchadnezzar king of Babylon, and he will kill them in front of you. Because of them, all the captives from Judah in Babylon will use this curse: ‘May the Lord treat you like Zedekiah and Ahab, whom the king of Babylon ·burned [roasted] in the fire.’ They have done evil things among the people of Israel. They are guilty of adultery with their neighbors’ wives. They have also spoken lies and said those lies were a message from me. I did not tell them to do that. I know what they have done; I am a witness to it" (Jeremiah 29:21-23, Expanded). When we come back to Ezekiel 11:5-12 God tells those who are about to be exiled that "You have killed many people in [Jerusalem], filling its streets with their bodies." He goes on to say, "Those people you have killed and left in the middle of the city are like the best meat, and this city is like the cooking pot." And since they have feared the sword God will drive them out by foreigners and punish the wicked for doing these things. All the way to the southern border of Israel they will be punished by the sword, for their murderous ways. "Then you will know that I am the Lord; [for] you did not live by my rules or obey my laws. Instead, you did the same things as the nations around you" (Ezekiel 11:12). The repeated usage from chapters 6 and 7 being shown in Ezekiel 11:10 is that God's character is holy, just, and pure. His purpose then is to execute judgment on those who do not do His will in the least bit. they refuse to live by His commandments. The best answer that comes to my mind in regards to Ezekiel's question in verse 13 is that Israel will be spared, but those who do wickedly will die in their sins. The truth that God wants His people to remember in Ezekiel 11:14-16 is that even while the people are sent "far away among the nations" being "scattered...among the countries" is that God is their Temple "to them in the countries where they have gone." I will gather you...and bring you back...and I will give you back the land of Israel again (v. 17). I will give them a desire to respect me completely [one heart]...I will put inside them a new way of thinking [a new spirit] (v. 19a). I will take away their stubborn heart [heart of stone] to give them an obedient heart [heart of flesh] (v. 19b). They will be My people and I will be their God (v. 20). These things are fulfilled in the person of Jesus Christ. When He came to heal the people, those who truly believed in Him, they worshiped Him for who He was, the Son of God. They knew from where the source of power and authority came from that Jesus had. Christ said this: "Truly, truly, I say to you, the Son can do nothing of Himself, unless it is something He sees the Father doing; for whatever the Father does, these things the Son also does in like manner. For the Father loves the Son, and shows Him all things that He Himself is doing; and the Father will show Him greater works than these, so that you will marvel. For just as the Father raises the dead and gives them life, even so the Son also gives life to whom He wishes. For not even the Father judges anyone, but He has given all judgment to the Son, so that all will honor the Son even as they honor the Father. He who does not honor the Son does not honor the Father who sent Him" (John 5:19-23, New American Standard). So, this is where I start thinking that since Jesus said, "For not even the Father judges anyone, but He has given all judgment to the Son," that He is the one who renders judgment on all people and not just the people of Israel. For we read, "When the Son of Man comes in His glory...All the nations will be gathered before Him...Then the King will say to those on His right, 'Come, you who are blessed by My Father, inherit the kingdom prepared for you from the foundation of the world." 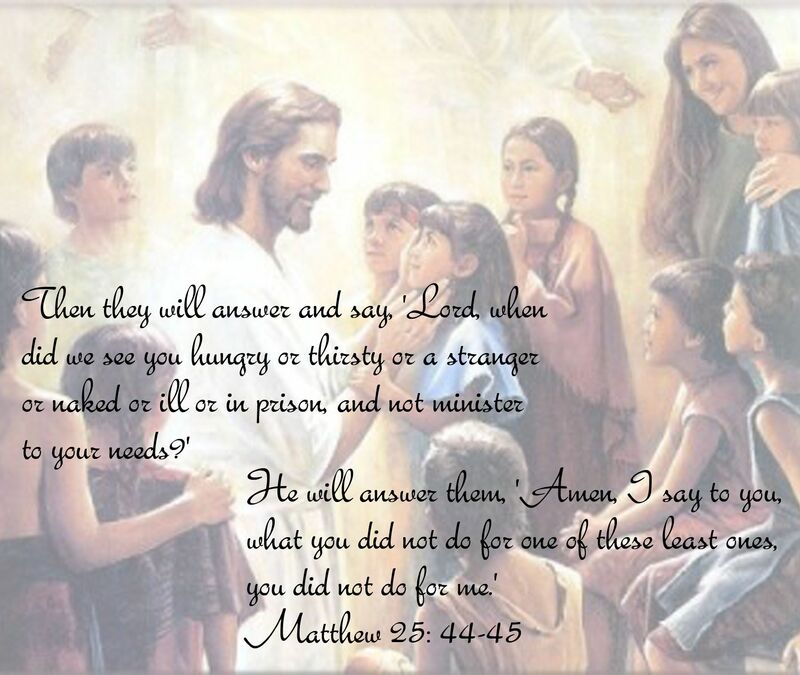 And the King will answer them...to those on the left, "Depart from me...into the eternal fire prepared for the Devil and his angels...Whatever you did not do for the least of these, you did not do for Me either" (Matthew 25:31-45, Holman Christian Standard). John tells us that to those who believe Jesus is the Messiah, being born of God, loving the Father "Also loves the one born of Him"--being the Christ (1 John 5:1). He goes on to say, "By this we know that we love the children of God: when we love God and keep His commandments. For this is the love of God, that we keep His commandments. And His commandments are not burdensome, because everyone born of God overcomes the world. And this is the victory that has overcome the world: our faith. Who then overcomes the world? Only he who believes that Jesus is the Son of God. This is the One who came by water and blood, Jesus Christ--not by water alone, but by water and blood. And it it the Spirit who testifies to this, because the Spirit is truth. For there are three that testify: The Spirit, the water, and the blood--and these three are in agreement(1 John 5:2-8, Berean Study). The water in the above passage from 1 John 5:1-8 is a reference to Jesus' baptism while the blood is a reference to his death. God's Spirit, the Holy Spirit testifies, bearing witness of the Messiah's baptism and death, for "the Spirit is the truth" (1 John 5:6). So, the essence is that there "Are three witnesses: The Spirit, Christ's baptism, and his death; and these three witnesses agree" (1 John 5:7). We could also reason that what John is saying is that God is identified in a triune nature: being God, the Father, God the Holy Spirit, and God as the Son, Jesus Christ. "[All] three..bear witness: the Spirit, Christ's baptism (and the water), and Christ's death (and the blood)...these three agree in one" (1 John 5:8, King James). Thus we see that while God has given all authority to the Son, Jesus Christ, it isn't the Father who judges the nations but Jesus Christ. While we're told in the Old Testament God judges the nations as well as His people Israel, it is in fact Jesus who does the judging. It is by the Spirit that we have not only access to the Father by the Son, nor are we able to recall things to mind by His Spirit, but the Spirit advocates on our behalf before the Father. So it behooves us to believe He sent the Son, Jesus Christ, to make us whole and one in Him. For if it is by the water that we are buried into His death, it is by Christ's blood we are redeemed. It is by Him who judges all, Jesus Christ, as to whether or nation we receive eternal life or eternal punishment. I pray this helps to open your eyes that Jesus is our Judge, our Lord and Savior, and King of Kings. In Jesus' precious and holy name I pray. Amen.